Real-time tracking has quickly become an industry standard. For shippers, having complete visibility into their freight’s location at all times is an expectation for working with carriers. Now more than ever, shippers are focused on end-to-end service from both carriers and 3PLs. In order to best service our customers and provide you with as many freight opportunities as possible, we need to work together to deliver full visibility and transparency on all loads. 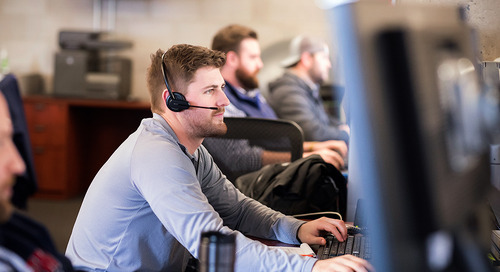 For our network carriers, we’ve worked hard over the past several years to develop a full suite of tracking options to meet your needs and capabilities. Starting on May 1, 2019, Coyote requires that all contract carriers provide some form of automated location updates via one of our four convenient electronic tracking options. Pick the connection that works best for your fleet. With the ELD mandate in full effect, all carriers should have a compliant device in their trucks. Quickly and easily connect your ELD to Coyote once, then provide your tractor number for the power unit you’re using, and you’re good to go. Coyote can connect with your TMS system through a data aggregator or directly via an API or EDI connection. Provide your driver’s tractor and trailer number once you're set up, and you’re ready to start hauling. Coyote’s load board app, CoyoteGO, allows drivers to share their location for all loads they move for Coyote. But GPS tracking is just the beginning. CoyoteGO puts the Coyote load board in the palm of your hand, allowing you to submit load bids, book loads, request fees, invoice loads and more. According to CarrierLists, CoyoteGO ranks highest in usage and stickiness among the traditional 3PL/broker apps. Don’t have our app yet? Drivers who have provided consent to receive text messages can receive a text allowing drivers to provide location updates through their cell phone. Achieving 100% tracking across our network means a commitment from everyone. We realize there isn’t a one-size-fits-all solution for all carriers in our network, and that’s why we’ve invested time and resources into giving you with multiple choices for real-time tracking. Please contact your Coyote rep if you have any questions or reach out to one of our technology experts.